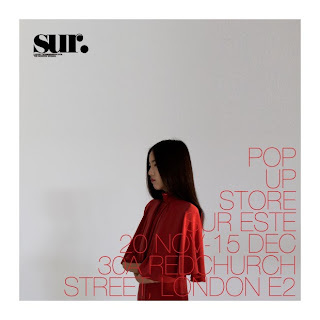 "Luxury womenswear brand, Sur is staging it’s third London popup in the run up to Christmas. For four weeks it will be based at 30A Redchurch St in Shoreditch. Sur will be presenting it’s Fall Winter 2013 collection, The Okinawa Collection. All Sur’s pieces are made in small ateliers in and around Barcelona, from the most luxurious fabrics and the best leathers. In addition to their own collection, Sur will present a selection of brands from ‘the South’ – from Portugal, Spain and Italy. Also, every Thursday there will be drinks, music and late night shopping." Open every day from 10am-6pm except Thursdays, 10am-9pm.